We offer two models of Pedilux footcare systems, each with their own distinct advantages. Both models are supplied with five precision made genuine sapphire coated instruments and a full one year guarantee (the Two Way model's rechargeable battery has a six months guarantee), and our unconditional 30 Day money-back guarantee. The Pedilux Profi is a professional footcare system for use in your own home. The Profi is mains powered and has two speeds - an especially gentle speed for precision work - as well as forward and reverse rotation. Many practitioners currently use, and recommend, Pedilux to their clients. The Profi comes complete with a neat, long lasting storage case that protects the Profi and incorporates the motor and control panel. The Profi also has the added advantage of a 6-inch wand - a real boon for the less abled and anyone who finds scissors and clippers unwieldy. The wand makes your footcare routine a pleasure and brings toes and feet within easy reach for everyone. The sapphire-coated tools are not only built to last but make caring for your feet safer as there is no cutting involved. As there are no sharp implements Pedilux is ideal for diabetics. 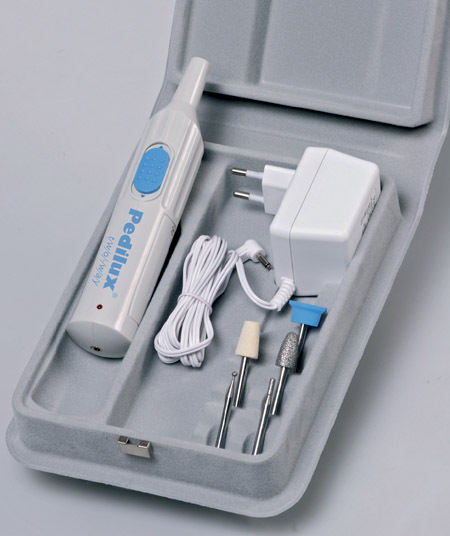 The Pedilux Two Way is a small hand held unit powered by a mains and rechargeable battery unit, rather like an electric toothbrush. The Pedilux Two Way is designed for use when you are travelling without the Profi. It has one speed setting and comes with a handy travel case.